It is now widely argued that humanity has entered a new geological epoch – the Anthropocene – characterised by the unprecedented scale, scope and interactions of multiple human impacts on the biosphere. Climate change is the most familiar of these impacts, but it is far from the only one, and understandings of what the concept of the Anthropocene means for health policy and public health practice are still at an early stage. The idea of the Anthropocene can also serve as a ‘window’ into broader issues related to the connections between environment and health, in such contexts as the health consequences of urban air pollution and the health implications of how cities are designed and managed. In 2013, the normally cautious International Agency for Research on Cancer designated ambient air pollution as a Group 1 carcinogen, the category for which evidence of carcinogenicity from multiple research designs is strongest. As Eugene Milne and I point out in the Autumn, 2017 issue of the Journal of Public Health (of which we are joint editors), this was probably the most under-reported public health story of 2013. According to the World Health Organization, most of the millions of premature deaths attributable to ambient air pollution occur in low- and middle-income countries, but air pollution’s health impacts are not confined to far-away places. Exposure to particulates and nitrogen dioxide in outdoor air pollution probably accounts for around 40,000 deaths per year in the UK, and they are unequally distributed. ‘Residents of leafy suburbs’, we wrote, ‘do not face the same exposures as those living, working and walking in traffic-intensive urban settings; indeed that leafiness itself is to some degree protective’. A special section on environment and health in the new issue of the Journal foregrounds the findings of a massive effort by Annette Prüss-Ustün and colleagues to update WHO estimates of the global burden of disease attributable to environmental determinants of health. They conclude that just under one-quarter of global deaths and disability-adjusted life years (DALYs) were attributable to environmental exposures in 2012 – although ambient air pollution exposures were only one contributor. Especially critical from a policy and equity perspective is their observation that: ‘The lower people’s socioeconomic status the more likely they are to be exposed to environmental risks … Poor people and communities are therefore likely to benefit most from environmental interventions as they are disproportionally affected by adverse environments’. In our editorial, we also argued that technical fixes like policies supporting or subsidising a shift to electric vehicles may be inadequate responses to the equity issues raised by how societies design transport systems and urban infrastructure more generally, revisiting the question asked in a 2011 Journal article: ‘Are cars the new tobacco?’ The authors concluded that they are. The UK’s Sustainable Development Commission, now unfortunately disbanded, took an even more holistic and thoughtful view in a report on Fairness in a Car-Dependent Society that is still available online. Like the broader idea of the Anthropocene, these perspectives direct our attention to the functional and ethical inadequacy of incremental solutions. These issues are in no way confined to the United Kingdom. 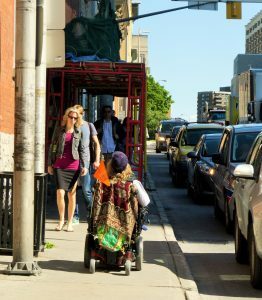 The illustration shows the realities of simultaneous exposure to risk of traffic injury and high levels of pollution in a low-income area where I used to work in downtown Ottawa, Canada’s national capital. 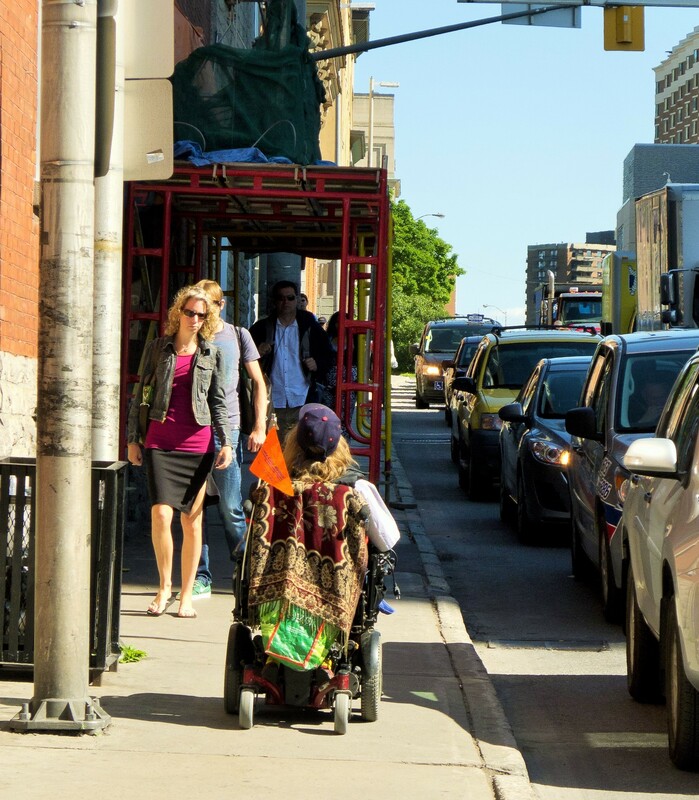 Think of the multiple exposures of the wheelchair user in the picture, and contrast them with the ‘epidemiological world’ of the occupants of air-conditioned vehicles just feet away. Above and beyond such failures of humane planning, high-income countries continue to subsidise fossil fuel consumption in a variety of ways. For instance, in 2014 the OECD pointed out that good, green Germany subsidised company cars through its tax system to the tune of almost €2,500 per car per year. This is grotesque on both environmental and equity grounds. Outside the high-income world, transport policy in many countries prioritises convenience and speed for a car-owning domestic minority and foreign investors and tourists who demand ‘world-class’ infrastructure – a global health equity issue that deserves far more attention than it has received. Encouragingly, at least in the academic world more attention is being paid to such questions. A lead article in the September issue of The American Journal of Bioethics calls for integration of the fields of environmental ethics, public health ethics and bio(medical)ethics. Today, despite shared values and overlapping concerns, people and institutions concerned with these areas often don’t talk to one another. Coincidentally – well, not really – the new issue of the Journal of Public Health also includes a call for contributions to a special section on public health ethics, which will appear in 2018. All views expressed are exclusively those of the author.